The coaching career of Dennis Bene was foreshadowed when he was the quarterback at Salpointe Catholic High School in 1984. He was under the tutelage of one of the coaching legends in the Tucson area, the late Ed Doherty. Bene also spent one season as an assistant coach for Jeff Scurran at Pima Community College and two years as an assistant under Pat Welchert at Salpointe before taking over the head reins in 2001. 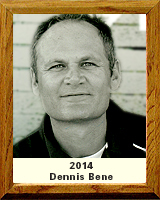 In his 13 seasons at Salpointe Catholic, Bene has a remarkable .812 winning percentage with 126 victories against only 29 losses. His 2013 Salpointe squad compiled a 14-0 record and won the state championship. The 14 victories are the most in one season in Salpointe history. Bene has a 70-4 conference record during his 13 years at Salpointe and has won 10 league or conference championships while making 12 state playoff appearances. His squads have set 32 school and individual records while posting an overall grade point average between 3.15 and 3.65 each year. He has coached 113 first-team all-conference players as well as nine conference Player of the Year recipients and 23 first-team all-state selections. Seventy of his players have gone on to play at the collegiate level at 14 different schools. Bene received his B.S. in biology from Northwest Missouri State University after a stint as quarterback at Scottsdale Community College. He received a Doctor of Veterinary Medicine degree from the University of Missouri and did an internship in Equine Medicine and Surgery at Kansas State University. Bene, 47, is married. He and his wife Mistie have three children – Rocco, 27; Chase, 11; and Mia, 8.